In 1978, Theresa Russell made her second-ever film appearance, co-starring with Dustin Hoffman in Straight Time. 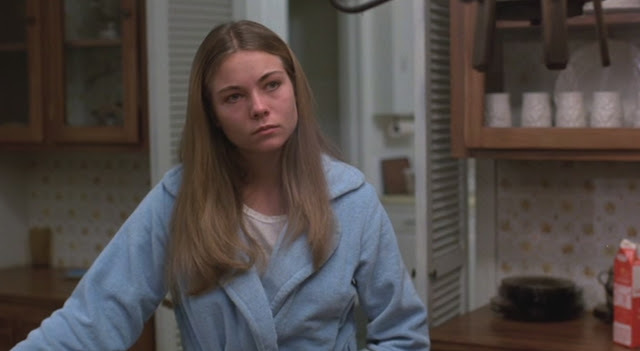 Looking very young and beautiful, Theresa Russell gives a very engaging performance and the camera simply loves her. In Straight Time, Theresa Russell plays Jenny Mercer, a young woman working at an employment agency who befriends the recently paroled Max Dembo (Dustin Hoffman). Her motivations are never really made clear in the movie, but she nevertheless begins a romantic relationship with Max Dembo. Regardless of her ill-defined character, Theresa Russell is highly watchable, as are the other members of the supporting cast. In fact, the supporting cast of Straight Time (Harry Dean Stanton, Gary Busey and M. Emmet Walsh alongside Theresa Russell) really make the film worthwile.